Every one of us needs some sort of privacy from time to time to gather our thoughts no matter how old we are. A tent-like structure is one of the best ways to help kids to occupy themselves, calm themselves down and look forward to going to sleep and waking up. Parents' reviews show that all of the young kids that got cabin beds installed in their bedrooms spend a lot more time in their rooms playing. This keeps them busy playing during weekends allowing parents to have a little longer sleep in time. Cabin beds with shelves underneath give your children their own under stairs storage - almost like this, but uniquely theirs. Some kids are so happy with the idea that they have a tent in their room that some parents say, ‘Our son is yet to sleep in the cabin bed as he's too content with sleeping underneath it within the tent area.’ If you're looking for inspiration check out 25 Cool Tent Design Ideas For Kids Room. Mid sleepers come highly recommended for both boys and girls. They are stylish, compact and offer a lot of storage. With the options that we offer you can buy a mid sleeper bed with a pull out desk, drawers and a wardrobe. Colours provided by us are both pinks and blues with superhero and princess characters suitable for both boys and girls. Some parents won’t purchase standard kids bunk beds since they are too tall. 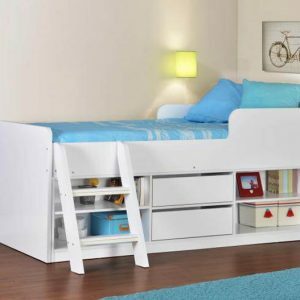 The height of the bed can cause a safety concern for super active kids. For hyperactive kids, mid sleepers are a perfect solution with either plenty of storage and their own pull out desk or a hideaway. The novelty of this type of bed will make them as happy to accept it into their lives as a standard bunk bed would have been. One last thing that our customers enjoyed is having their kids help them assemble the mid sleeper beds. All beds are easy to put together with clear instructions and can create a bonding family experience. It's a way of getting a child involved in building their own safe haven and which gives them a sense of achievement. You will really appreciate the presence of a play area underneath your kids bed when the schools are closed for holidays. Kids will spend hours on end playing in their forts, tents, castles whichever they decide it to be in their imaginations. Sleepovers inside their tent will become the thing they'll be looking forward to with anticipation. You'll notice, with a sense of huge relief, how their behaviour levels are all of a sudden more manageable. The beauty of our tent beds is that you can easily remove them if your kids decide that they are all grown out of it. 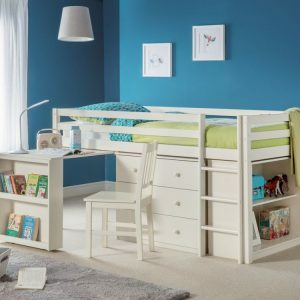 These kids bunk beds with play area will easily last up until college. 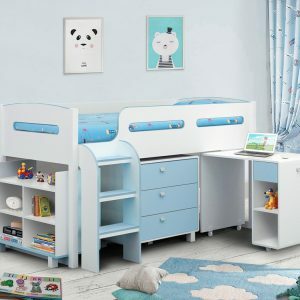 Low sleepers that offer lots of storage will help your child to store away their bits and pieces. It teaches them to quickly see the difference between a tidy and a messy room. The drawers underneath the bed create instant access to the most basic things. You can arrange it in a way so that they have their sock drawer handy first thing in the morning. A full sized bed can be a cool feature, but low sleeper beds will win them over with all the nooks and crannies that it offers. Drawers, pull out desk and shelves will help them personalise their bed and even display their LEGO sets or action figures. It is one of the best compromises between a full bunk and a single bed if you know that your kid is super hyper and will most likely end up swinging off the top bunk while no one's watching.